Few liquor bottle designs have been found protectable as trademarks, despite a U.S. Supreme Court decision in 1992 that established that product packaging might qualify as an inherently distinctive trademark. The Examining Attorney refused registration on the ground that this was nondistinctive packaging. The TTAB affirmed the refusal of registration. It began by defining the relevant field as liquor bottles generally rather than limiting it to “mescal” bottles. It then determined that, even if the applicant were the only user of this exact combination of features, the design merely combined “a common bottle shape with other ordinary features in a relatively unremarkable way.” Since consumers would not view this as source-identifying, it was not inherently distinctive and was unregistrable. In re AGPCH, S.A. de C.V., Serial No. 87125518 (T.T.A.B. April 18, 2018). The applicant subsequently abandoned its application. Note, however, that even a bottle that is not inherently distinctive may acquire consumer recognition as a distinctive trademark through use and advertising (so-called “secondary meaning”). A currently pending lawsuit against a whiskey competitor contrasts with the foregoing case in that Jack Daniel’s is claiming both inherent distinctiveness and secondary meaning for the federally registered JACK DANIEL’S bottle consisting of “a square bottle with angled shoulders, beveled corners, and a ribbed neck, a black cap, a black neck wrap closure” and various labeling and wording. Jack Daniels claims not only that its bottle configuration is inherently distinctive, but just in case, it also is claiming that its continuous use of this bottle since 1875, except during Prohibition, as well as the many hundreds of millions of dollars spent over many decades for advertising and promotion, and the billions of dollars in sales, have given it secondary meaning, and indeed made it a famous mark. How do you think this case will be decided (if it is not settled before trial)? Are square liquor bottles common? 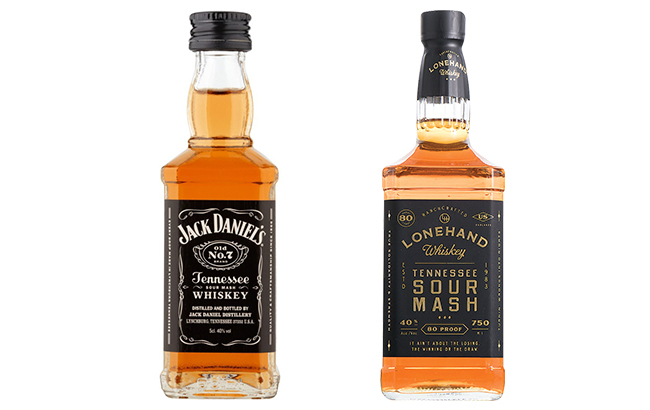 Has the Jack Daniel’s bottle acquired distinctiveness as a source indicator? Have the defendants come too close? Jack Daniel’s Properties, Inc. v. Dynasty Spirits, Inc., Case No. 5:18-cv-02400 (N.D. Calif. April 20, 2018).